The Official Home Page of Pete Kennedy, New York City guitarist and singer songwriter. 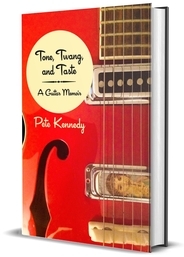 Tone, Twang & Taste: A Guitar Memoir, by Pete Kennedy, is available for pre-order, and shipping by the end of October 2018. Pete has assembled hundreds of musical stories from his life, starting with the day he first discovered the guitar as a child. This book features lots of rare photos that span his whole life. $21.99 plus shipping. 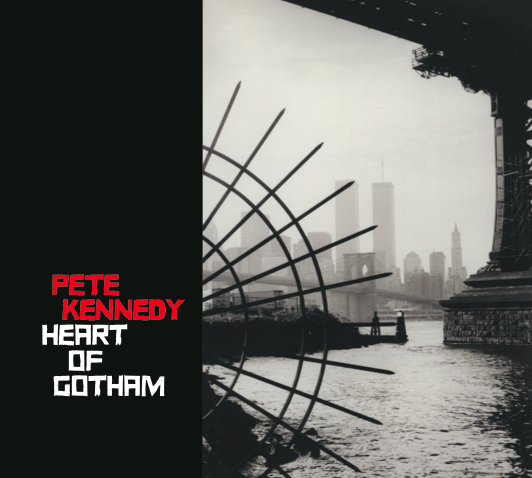 Pete Kennedy's "Heart of Gotham"
Pete Kennedy's "Heart of Gotham" (2015), his first solo effort as a singer-songwriter in two decades, has been called by one listener a "Love letter to New York City." The project, recorded over a five-year period in Pete's Manhattan studio, is a song cycle, with opening and closing themes, and musical and lyrical motifs that recur and unify the narrative thread. Each piece, however, stands alone as a pop-rock song, so the album can be heard as a continuous cycle, or simply as a collection of passionate rockers, delivered in Pete's soulful, roughhewn voice. The songs were written in a series of early morning sessions over coffee at an East Village diner. They deal with the ongoing quest to find one's place, an identity, in the world's most vibrant and diverse city. Better known nationally as a guitarist, Pete does in fact play all the instruments on the collection, as well as singing all the lead and background vocals, but it's really his return to delivering his own lyrics that makes this project markedly different from his two-decades long, and continuing, collaboration with wife Maura, as The Kennedys. Celebrating twenty years as a band and married couple, Pete and Maura are eschewing nostalgia, and defying expectations, by releasing three CDs, comprising forty new recordings, thirty eight of them new original songs. "Heart of Gotham" is Pete's contribution to the triptych. "Villanelle" is Maura's solo project, an inspired collaboration with poet B.D. Love, and the set is rounded out by "West," a classic sounding Kennedys roots-rock album. 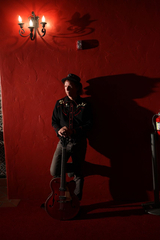 Prior to Pete and Maura's first meeting at a song swap in Austin, Pete was well established as an award-winning singer-songwriter in his hometown, Washington, D.C., and Maura was a top hand on the Austin scene. Over the course of a dozen duo CDs, they have graciously folded their talent and inspiration into the confluent sound and vision of the Kennedys duo. That collaborative blend continues unabated, with the addition of these contrasting solo projects, and for Pete, "Heart of Gotham" marks a spirited return to muscular, vibrant solo singing and songwriting, and to a classic rock band sound. Most of us will know, by now, Pete’s guitar mastery. His work with his wife Maura and other artists has been illuminating Americana for twenty years. This record opens new windows, doors and alleyways, and represents the great leap forward that the Kennedys have made during this one short year. They have newly produced over forty songs, I believe. This is Pete’s solo contribution to the celebration, and it is a jewel in the crown. In a true storyteller’s fashion, Pete introduces set and scene. 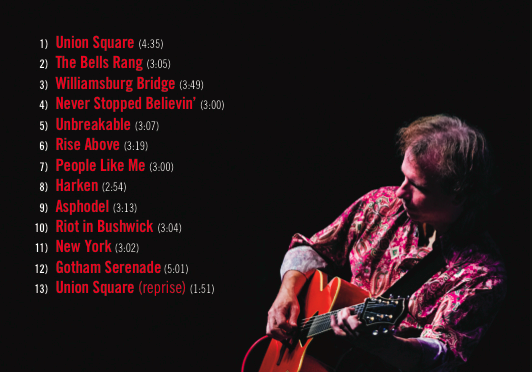 From the ringing chords of “Union Square,” you know that you are into classic American music, performed by a master. How many lyricists can reference both Cole Porter and Lucky Luciano in one song? That’s Pete’s New York: inclusive, steeped in history and alive with promise, as he hears a Russian church bell welcome Easter. The concluding guitar solo rings clear as a bell, as well. I should mention here, Pete plays and sings all the parts on this record, and there is not a speck of cereal, as the old TV commercial sloganed. From drums to strings to vocals, this is as strong a record as you’ll find, performed by a man whose bones are probably composed of intertwined half notes, full notes, quarter and eighths. Probably sixteenth, but I can’t count that high up. So the bells continue. “The Bells Rang” brings us to the civil rights, or I should say, the human rights movement. You’ll find the steady musicianship supporting complex but at the same time utterly unpretentious lyrics. They seem to have been written on a park bench. I wish Dylan wrote this well these days, but the times they are a’changin’. The actual circumstance behind the song was Pete’s visit to Harlem on the night of Obama’s election, and the elation of a victory long in the coming. It’s to Pete’s credit that he wrote the song as an archetype, specific and universal. “Williamsburg Bridge” takes us to a personal place between Biblical references to Moses and the Promised Land to the holding of hands and a simple kiss. A NY girl becomes a Pharaoh’s daughter. It is a song for everyone who has crossed many rivers and dark seas. “Never Stopped Believin’” achieves a more confessional style, reflecting his childhood and now, his adulthood in NYC. It’s both a heartfelt, acoustic anthem to love, but also to his love of his new home town. I think it’s about the power of love as something that can arise from the touch of a teenage hand to the rough streets of a complex and robust city. It features some tough times hitching, and a sense of homecoming after great distress. The heart rises. The music will transport you there. Now we come to “Unbreakable,” about the immigrant experience, something extremely close to my heart, as a longtime instructor with second language students. Pete here totally avoids sentimentality, and politics, and centers his focus on the streets that people walk in order to make a life, for selves and families. “Rise Above” is the most economical song on the record, and that works so well: It has an anthemic hook that you won’t ever forget, something so direct and true, and so obviously spoken with an authority of a soul that has watched and pondered. His vocals truly carry this one! I personally love the string-work on “People Like Me.” Pete is the master of every string. The chord progression makes one wish for some of the great other Pete, Townshend, and Pete, the Kennedy, approaches the vocal as all of the above: direct, straight from the heart, with the slight rasp that is totally earned by a life of genuine feeling. Love this one. Do we hear influences? “Harken” clearly and intentionally harkens to the Byrds, who have obviously influenced Pete’s music deeply. It’s a song of straightforward love, beautifully played and sung, with the strings mirroring the vocal melody. I wish there was real radio. This would be on all the time! The song “Asphodel” will remind us of Mr. Kennedy's literary acumen. He sources everyone from Ginsberg to W.C. Williams. This one really expresses Pete’s higher vocal register, and his harmonies. Wish I could do this. I’m glad someone can. “Riot in Bushwick” unwinds some wicked Rockabilly Swing. A “riot” becomes an ode not only to 6th Street, but to a neighborhood filled with music, that power, that sense of rebellion, and to this day, the fear that rock and roll instills in mindless, battalioned authority. Because it’s rock and roll. And we like it. This song will have you dancing while you’re thinking. The song “New York” takes us to a personal place, again. It’s a love song, but to a city, and that does not diminish the sentiment one bit. When we see the “hawks circle over Central Park,” that observation obviously comes from the poet. Pete could have written about sirens and slabs, but instead, he looks into the the soul of a city that still retains nature, even as it’s landmarks soar. That nature is our own. The minor shifts in the melody and the twelve string arrangements will engage tears. And then Pete lets loose with a brilliant burst of distorted electric guitar, worthy of a tough street in tough times, and it’s as plain right and brilliant as that first moment you ever crossed a New York block. We finish, essentially, with “Gotham Serenade,” which is something the Boss should cover. To me, this recollects the best of the great East Coast songwriters: precise observation, unpretentious lyrics, and an accessible as well as anthemic melody. Here’s Pete at his best rock guitar. Not that the rest of the record doesn’t have that in abundance; just here, he stretches the solo a little longer, which is more than welcome. He writes his solos as pieces, musical entities. They become songs unto themselves. The coda, “Union Square (reprise)” allows Pete to speak again through his guitar, just briefly. A beautiful closure to a splendid record. Pete walks the neighborhood. That works for me, and Lao, and James Joyce, and Cole Porter, and Ginsberg, and Kerouac, and many more of us who check the sky for wonders, even as the rising edifices interrupt our gaze. Get this record, because you will never walk a city street with a greater advisor. And you will see some very clear blue in the heavens. Concrete and sky will never again look the same. This deliciously wordy and evocative offering from singer-songwriter Pete Kennedy has been described as a "Love letter to New York City," and it's certainly an impressive piece of work, prompting comparisons with similarly gifted tunesmiths from the seventies such as Willie Nile and Steve Forbert. The finished product was by all accounts five years in the making, as Pete took the occasional break from his long standing collaboration with wife Maura in The Kennedys to assemble a genuinely solo set which found him playing all the instruments on "Heart of Gotham" as well as handling lead and background vocals on every track. "Union Square," "Gotham Serenade" and "New York" are the best of the bunch. Heart of Gotham is Pete Kennedy's solo contribution to The Kennedy's prolific three-album 2015. He wears that Heart on his sleeve as he draws one into his New York City world. His voice is raspy like Steve Forbert, and somewhat subdued as it is when he sings harmony with duo partner and wife Maura Kennedy. When an artist plays all of the instruments on an album, the synergy of the production can suffer, but Pete makes the jangle of his wide ranging guitar driven rock sound fresh and alive on each track, and surprisingly at home in a place more likely to move to an urban beat. "Union Square" kicks off the New York theme with ringing guitar chords igniting the aural landscape. One Twenty-fifth Street, Second Avenue, the Statue of Liberty, the Times, the Williamsburg Bridge and the Chrysler Building all punctuate the pulse of Heart of Gotham, as Pete Kennedy's optimistic muse flourishes amid the concrete and steel. He drops a lot of names of people whose art was inspired by the City—Ginsberg, Hopper, Cole Porter and especially William Carlos Williams in "Asphodel." Like them, Kennedy tells his stories of New York with his own clearly defined, if eclectic aesthetic. It may seem odd that Pete and Maura have settled in New York City—that their cheerful, compassionate outlook would survive the crush of the City. Yet here is Pete emerging Atlas-like with the Big Apple held over his head on the strength this brilliant song cycle. an all instrumental CD celebrating pre-rock electric guitar. Electric guitars were invented in the 1930's to accommodate the big sound put out by large swing bands. 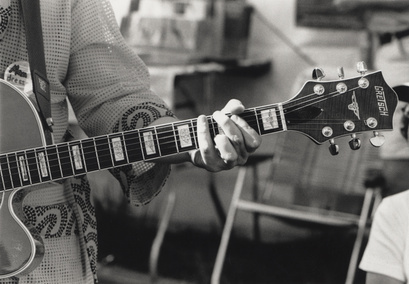 Guitarists soon discovered that the instrument had a voice all it's own, and top players in jazz, blues, country and rockabilly gravitated to the sound, led by musical and electronic pioneer Les Paul. The instrument didn't enter mainstream culture as a iconic and creative luxury item until The Beatles wielded them on The Ed Sullivan Show, launching an avalanche of sales to everyone from kids jamming in the garage to high powered wolves of Wall Street with money to burn on expensive toys. This followed on the heels of a beatnick/coffeehouse singer interest in acoustic guitars, but the gap between the 1930's and the 1960's raises an interesting question: who were the guitar players before the folk boom and Beatlemania, before Hendrix and Clapton? What music did they play, what did they sound like, and how did they influence the guitar heroes of the boomer generation? Pete has spent years studying these players, meeting with the ones who still played and those who wanted to pass along their largely forgotten style(Les Paul once said, "most people think I'm a guitar!"). It turned out to be a labor of love, because the level of sophistication of the pre-rock players, who combined jazz, country and early rock'n'roll with a solid grounding in musical theory and technique, was matched by their sense of fun and humor, and that all came across in the clean, bright tones and lyrical chops of the era...a sound quite distinct from the Claptonesque rock that has dominated the guitar world in recent decades. Les Paul, Chet Atkins and Django Reinhardt are names that might be known to the general public, although their music probably remains unheard by most. Johnny Smith, Tal Farlow, Hank Garland, Lenny Breau, Mary Osborne, Tony Mottola, Lonnie Johnson, Leon Rhodes...the list goes on and on of top players who are nowadays known only to a small circle of guitarists, but to discover them is not only an adventure in American music's colorful past, but also a joyful plunge into a sound so fresh that it remains new today, preserved in amber from around 1959...the era of Tone, Twang, and Taste! Guitarist Pete Kennedy's bio, photos and samples of music can be found here.